Below are the spark gap waveforms for both 100BPS and 200BPS operation with a rotary spark gap, and also for operation with a static spark gap. These first two traces show how the voltage across the rotary spark gap changes over a period of 50ms. The voltage shown here is representative of the tank capacitor voltage, and the waveforms actually depict the slow charging and rapid discharging of the tank capacitor over time. The sharp vertical transitions represent the spark gap voltage rapidly collapsing to zero, as the airgap begins to conduct. This conduction time lasts only 120us, and is when the tank capacitor discharges into the primary winding of the tesla coil. The energy pushed into the capacitor throughout the long charging period is released as an intense pulse in the comparatively short discharge period. In the UK the mains supply frequency is 50Hz, and each cycle consists of both a positive and a negative half-cycle. The complete cycle repeats every 20ms. 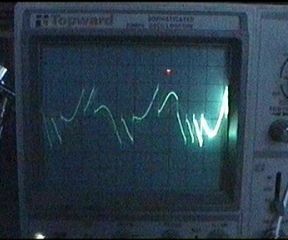 This oscilloscope trace shows the tank capacitor charging to around 20kV on every half cycle of the supply waveform. The 100BPS synchronous rotary fires every 10ms. That means that there is one charging period and one bang during each half cycle of the supply waveform. The rotary phase was adjusted so that it fires at the maximum voltage point, without voltage overshoot. 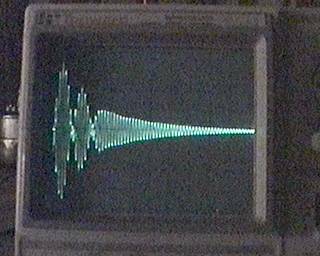 The oscilloscope trace opposite shows operation with a 200BPS synchronous rotary spark gap. 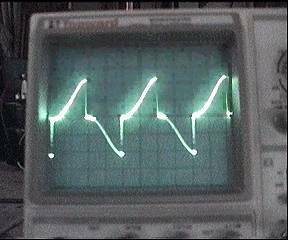 The waveform shows the tank capacitor charging to around 20kV twice in every half cycle of the supply waveform. The 200BPS rotary fires every 5ms. This means that there are now two charging periods and two bangs during each half cycle of the supply waveform. I find that this increased break rate gives better spark performance, but it also demands considerably more power. The rotary phase is adjusted to provide two bangs of equal magnitude during each half cycle. More details about rotary spark gaps can be found in this section, and the sections of resonant charging and inductive kick. The following three traces show the voltage across a static spark gap as the supply voltage is increased gradually using a variac. Notice how the firing rate of the static gap changes from one trace to the next as the variac settings is increased. 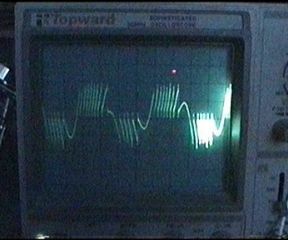 The oscilloscope trace opposite shows the voltage waveform measured across a static spark gap with the variac at a low setting. 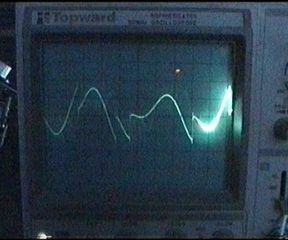 The waveform shows the tank capacitor charging to around 15kV once or twice in each half cycle of the supply waveform. The average firing rate is around 150BPS, but notice how the firing is quite erratic. This behaviour is typical for a static spark gap in a system employing resonant charging. 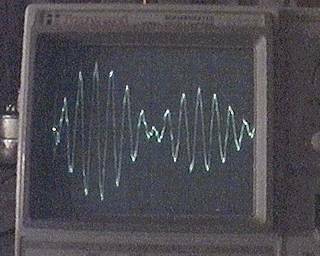 The oscilloscope trace opposite shows the voltage waveform measured across a static spark gap with the variac at a medium setting. The waveform shows the tank capacitor charging to around 15kV two or more times in each half cycle of the supply waveform. The average firing rate is around 270BPS. The firing is still very erratic. 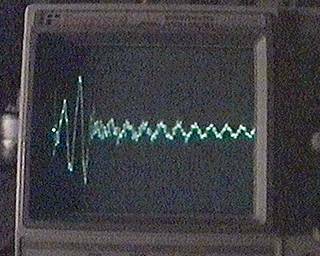 The oscilloscope trace opposite shows the voltage waveform measured across a static spark gap with the variac at a high setting. The waveform shows the tank capacitor charging to around 15kV roughly eight times in each half cycle of the supply waveform. The average firing rate is around 800BPS. The firing is still erratic, but power throughput seems much smoother because there are so many firings during each half cycle. The audio file opposite was recorded using a small (battery powered) cassette recorder. An attenuator was used to reduce the voltage measured across the spark gap. 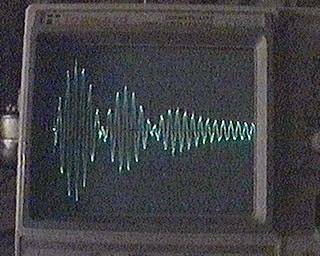 The reduced voltage waveform was then fed into the line input of the cassette recorder and recorded onto tape. Notice how the pitch (firing rate) rises as the power level is increased using the variac. This characteristic screaming sound could also be heard coming from the spark discharge at the toroid. From these waveforms we can see that the firing rate of the static spark gap is not only influenced by the choice of the capacitor and the spacing of the spark gap electrodes. It is also influenced by the setting of the variac, and generally increases as the supply voltage is increased. When some thought is given to the operation of the static gap, this behaviour makes sense. The firing voltage of a static gap is essentially fixed, so the rate of firing must increase when the supply voltage is increased in order to process more power. In practice the static gap can fire many times during each cycle of the mains supply waveform. This should be kept in mind when specifying the tank capacitor for high power systems using a static gap. Rapid firing rates usually imply high RMS currents through the tank capacitor. The traces above show the behaviour of the resonant charging system quite clearly. However, they do not give a good picture of the comparatively fast RF waveforms existing in the tesla coil itself after the spark gap fires. 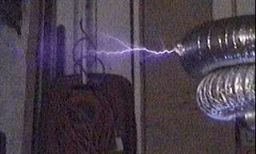 During the very short (120us or so) discharge of the tank capacitor, there are a series of fairly complex interactions which take place in the actual tesla coil. These are best observed by looking at the voltage field around an operating tesla coil with a much faster timebase setting. 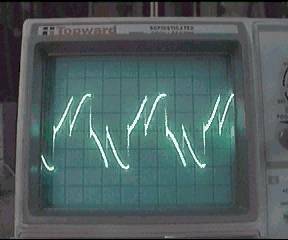 Below are a number of oscilloscope traces showing the Secondary voltage field produced by a sparking Tesla Coil. The E-field is picked up by a voltage probe situated well out of sparking range. The Voltage axis is currently uncalibrated but the horizontal timebase setting is shown next to each trace. All traces were obtained by firing the Tesla Coil in "one-shot" mode. The capacitor bank was slowly charged to around 16kV at which point the spark gap would fire. During the first five tests a short branched corona formation was seen from a breakout point on the toroid, but there were no arcs to ground. This trace shows the short burst of high voltage produced at the top of the secondary winding when the spark gap fires once. Two secondary notches can just be seen after the spark gap fires. 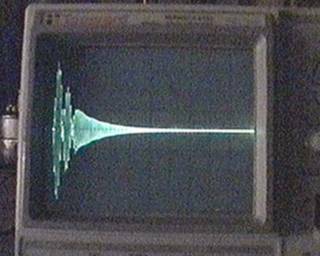 The voltage waveform then decays exponentially during the secondary ringdown. Corona formation absorbs energy from the secondary resonant circuit and causes the oscillating voltage to decay quickly to zero. This trace more clearly shows the notches of the secondary voltage waveform. These notches occur as a result of energy transfer back and forth between the primary and secondary systems. It can be deduced that the spark gap is quenching at the 3rd notch in the primary current waveform. This is evident because the secondary voltage decays exponentially after reaching its 3rd maximum. In this trace the natural resonant frequency of the tesla system can clearly be seen, and appears to be "modulated" due to the transfer of energy between primary and secondary. Notice the modulation envelope which is sinusoidal in shape ! The notches on the secondary voltage waveform are approximately 50us apart. These correspond to the instants at which all energy is actually in the primary system. There is also a 180 degrees phase change in the RF oscillation at each secondary notch. This trace shows the first two cycles of the secondary waveform envelope. There are approximately 6 cycles of RF at the resonant frequency (120kHz) between each notch on the secondary waveform. From this the coupling can be deduced as approx 0.16. The beat frequency is effectively 20kHz. The relative heights of the two beats gives an indication of the energy lost from the system over time whilst the spark gap is still conducting. This trace shows the first cycle of the beat enevelope in detail. During the first 25us energy is transferred from the primary to the secondary. At t=25us the peak secondary voltage is developed. During the latter 25us energy is being transferred from the secondary back to the primary. Significant distortion can be seen at the start of the waveform and at the peaks. This implies frequency components much higher than the resonant frequency of the secondary are also present. Harmonics introduced due to the non-ohmic loading by corona. Excitation of spurious resonances in the measuring electronics. Zero crossing noise being radiated from the primary system. All of the above traces show the secondary voltage with only light corona forming at the toroid. Although the corona does load the secondary system and absorb some energy, its influence on the waveforms is only moderate. The situation is different when an arc forms between the toroid and a grounded object. The two waveforms below both show the secondary voltage field over a 100us period. However, in the first instance there was only light corona from the toroid, whilst during the second test a 12" arc discharged the toroid to ground with an audible snap. With 8 inch corona forming at the toroid, the secondary voltage waveform is still very close to the ideal waveform suggested by computer simulations. The corona formation appears to drain a small amount of energy from the system, and also lowers the resonant frequency of the secondary circuit slightly. The effect of an arc to ground can clearly be seen in this one-shot test. The first 20us of the secondary waveform consists of 2.5 RF cycles of the normal secondary ring-up. After the 3rd negative peak occurs, the airgap between the toroid and ground breaks down abruplty. This results in a dramatic drop in toroid voltage, as energy is bled from the system through the low impedance of the arc. The E-field waveform indicates considerable HF radiation during the arc to ground. It is thought that the arc to ground effectively short circuits the secondary winding. This may cause energy stored in the self capacitance of the winding to be dissipated in the form of spurious higher frequency modes of the secondary. 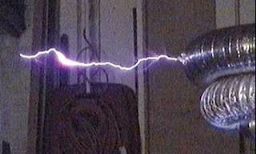 It is well known that the arc to ground greatly increases the HF radiation form a sparking tesla coil, and there is probably much scope for further investigation in this area. The negative dynamic slope of the arc resistance may also contribute to this harmonic production. 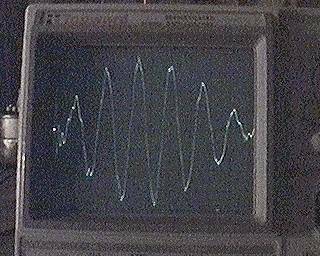 The voltage waveform shows a complete absence of any beat envelope following the initiation of an arc to ground. This suggests that most of the energy is in the secondary system before the arc forms. The arc then expends this energy in a very short period of time, resulting in little transfer of energy back to the primary system. This would explain why the primary spark gap often appears to run dimmer and cooler whilst a TC is discharging heavily to ground. In summary it should be noted that the information presented here is only the first step in verifying operation of a real tesla coil against the proposed ideal waveforms of a computer simulation. Conformance of a real system with computer models is very important if simulations are to be used as a tool to obtain better TC performance. From these real traces, the computer models can be refined. In particular the spark gap and streamer models can be modified so that the computer results match the real waveforms more closely. In general the TC producing corona only with no arcs to ground, very closely matches the expected behaviour of an ideal system. In the case of the power arc to ground, it appears that only the initial voltage ring-up remains before the secondary energy is dissipated in the arc. Therefore a system designed for good performance in "corona mode" should also perform well when arcing to ground ? For a more detailed description of concepts such as ring-up, coupling, notches, ring-down etc, please refer to the section on Tesla Coil Operation. Important Note:- The measurements necessary to produce the results displayed here, were executed with extreme care by a qualified electrical engineer. There is a very high risk of damage to equipment and personnel when measuring high voltages. This is especially true where direct connection is required. This technique is not recommended, and these results are presented here so that you do not have to perform the measurements. They are also presented as evidence that computer simulations give "true-to-life" data. Computer simulations are also a much safer way of observing the behaviour of high voltage systems !